Biography of Italian View-Painter, Noted for Vedute. see: 18th Century Colour Palette. Like his uncle Canaletto (1697-1768) and Francesco Guardi (17121793), Bernardo Bellotto was an Italian urban landscape painter. Unfortunately, in order to promote this family connection he sometimes signed his works Bellotto de Canaletto, causing much confusion for later historians. Bellotto's style of architectural cityscape painting was very similar to that of Canaletto, although his work was cooler, crisper, more attentive to clouds, shadows and foliage, and frequently characterized by a steely grey. He used camera obscura to achieve accurate renditions of the buildings he painted. After some years of trying to break his uncle's monopoly on Venetian urban landscape painting, he moved to Northern Europe where he went on to produce some of his most famous pictures for the Royal Courts of Dresden and Warsaw. When reconstructing the city of Warsaw after World War II, the Polish authorities used Bellotto's precise city views as a guide. An important contributor to Venetian painting, he remains one of the great Old Masters within his chosen specialty. 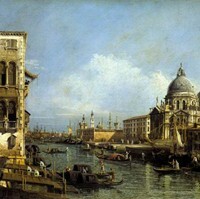 Bellotto was born in Venice in 1720, and trained at his uncle's workshop. By the age of 18 he was already a member of the Venetian Painters Guild, a club which only accepted the most skilled of artisans - including Bellotto's contemporary, the great fresco painter Giambattista Tiepolo (1696-1770). Between 1742 and 1747 Bellotto moved around Northern Italy, studying architectural and topographical paintings. Oil paintings from this period include Capriccio with the Colosseum (1743, National Gallery, Parma); Capriccio of the Capitol (1743, National Gallery, Parma); and View with the Villa Melzi d'Eril (1744, Pinacoteca di Brera, Milan). It is assumed that Bellotto worked closely with his uncle in his last years in Venice, as Bellotto's stylistic quirks start to appear in Canaletto's work. No doubt Bellotto prepared the composition drawings on some of the canvases that were then painted by Canaletto. Bellotto's individual style began to emerge around 1744, and can be seen in two paintings of scenes from the village of Gazzada, Italy (one of which can be seen in the Brera, Milan). 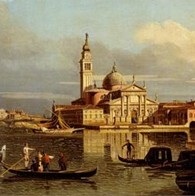 Bellotto abandoned the sunlit pastel palette characteristic of his uncle's work, for a cooler, more intense colour key. He chose saturated browns and greens, his skies became cool blue and he introduced stronger areas of shadow. A fine example is his View of Verona and the River Adige from the Ponte Nuovo (1747, Gemaldegalerie, Dresden). Bellotto left Italy for good in 1747, and was to spend the rest of his life, working in various European Royal Courts, including Dresden, Vienna and Warsaw. In 1747 he headed for Dresden, on the invitation of King August III of Saxony and Poland. Here, he was commissioned to paint 29 paintings of the city and the surrounding areas. These paintings in fact are all that remain of Dresden's former beauty, as most of it was destroyed during World War II. The canvases are huge, some 2.5 metres wide and were originally hung in the gallery of the Stallhof palace. Examples include The New Market Square in Dresden; Pirna Seen from the Right Bank of the Elbe; and The Old Market Square in Dresden: all c.1747-55, and on view at The Hermitage, St. Petersburg. It was here in Dresden that Bellotto's artistic style fully developed. His landscapes and cityscapes demonstrate a mastery of topographical precision, linear perspective, and control of light and clarity of execution. His brushstroke is unhurried, highly detailed to the point of being severe. In his handling of light, he is unconcerned with building atmosphere; in fact an unnatural calm pervades all his works. By the age of 35, Bellotto was enjoying international success. However, fleeing the violence which erupted in Dresden during the Seven Years War, and on the invitation of Empress Maria Theresia, Bellotto moved to Vienna. He stayed 3 years during which time he was commissioned to produce city scenes, images of the imperial residences and reproductions of the city's Gothic and Baroque architecture. The function of these paintings was primarily to decorate the palaces. Examples include Panorama from Palais Kaunitz (1759, Museum of Fine Arts, Budapest) and The Lobkowitzplatz (1759, Kunsthistorisches Museum, Vienna). In 1761 Bellotto moved to Munich, where working for the Elector of Bavaria, he produced more landscapes. After five years in Bavaria, he returned to Dresden, becoming a teacher part time at the Dresden Academy of Arts. In 1766 the artist moved to Warsaw. Although he had planned eventually to reach St Petersburg and work for Catherine the Great, he never quite made it. Instead, he remained in Warsaw for the next 14 years, and produced some of his finest paintings. In fact, his architectural accuracy was so accurate, his paintings were used as a draft blueprint for reconstructing Warsaw after the city's near destruction in World War II. His last works, twenty views of Warsaw, are considered his vedute of Northern Europe. A veduta is a detailed, large scale cityscape painting. The genre originated in Flanders with artists like Paul Brill in the 16th century. It was made popular by the Dutch in the 17th century, in particular by painters like Jan Vermeer (eg. View of Delft, 1659, Mauritshuis, The Hague). By the mid-18th century Venice was renowned as the centre of the vedutisti, who were much in demand by rich tourists on the Grand Tour of Europe: Canaletto in particular was seen as a Master, as (later) were the Rococo artists Francesco Guardi and Bernardo Bellotto. Within the veduta genre, painters became known for their specialities, for example Giovanni Paolo Pannini (16911765) was the first veduta to focus on painting ancient ruins and Giambattista Piranesi (1720-78) was the foremost master of veduta etching. Bellotto died in Warsaw at the age of 60. In contrast to his uncle's work, most of which was produced for the tourist market and hence widely copied, the majority of Bellotto's paintings ended up in the private collections of European Royalty. As a result, they were not widely seen, so he remained a relatively obscure figure in art history. It was only in the 20th century that he was re-discovered and properly evaluated. Today, his paintings can be seen in many of the world's best art museums, notably the Gemaldegalerie Dresden and the National Museum of Warsaw.